The CB Contractor Series Core Bits are designed to complement hand held drills for countertop and wall tile drilling, common in plumbing installations. Each core bit features a central carbide drill bit to guide each coring for precise, professional results. The PCB Series Tile/Stone Professional Series Core Bits are ideal for heavy tile applications as required by tile installers. These core bits are suitable for countertop, wall tile and floor tile drillings, with the capacity to handle light concrete and stone drillings. As such, they are available in a wide range of sizes and can be outfitted on hand held drills, angle grinders, and drill stands. 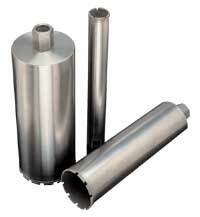 These core bits come standard with a 5/8"~11 NC thread arbor. 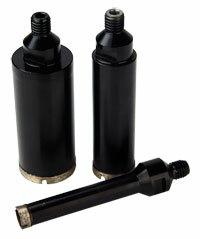 The PCB Series Stone/Concrete Professional Series Core Bits are perfect for stone and concrete applications. Primarily outfitted on core drill stands, these core bits contain high quality diamonds in a dense segment matrix, which results in quicker drill speeds and excellent footage. Standard in each of these core bits are a male adapter and a 0.1" segment width. 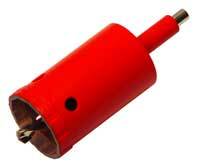 The PCB Series Concrete Professional Series Core Bits are engineered for fast, free drilling of reinforced concrete. 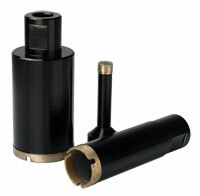 These core bits are equipped with 0.1" wide segments and 1-1/4"~7 NC thread arbor.